Home > Affiliate Marketing > Uh Oh….You’ve been rejected from a network……Now what? Uh Oh….You’ve been rejected from a network……Now what? Despite what many of you in the recently rejected boat may think, there is life after affiliate network rejection. There is light at the end of the tunnel… you just have to be looking for that light, and not trying to eye-snipe coins at the bottom of the river. 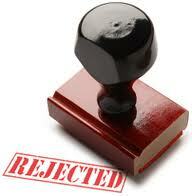 There are many different reasons affiliate applications get rejected, but some are definitely more common than others. The specifics of all this, I’m quite sure I’m not at liberty to get into here too much. But thankfully, we can at least discuss some of the more generalized, common and blatant things that will get you rejected time and time again. Think: things that you can easily work and hopefully improve upon for your future applications so you can stop getting rejected so darn much. One of the biggest mistakes made on affiliate applications is the website portion. While technically you can get away with putting pretty much anything here, considering how this is Internet marketing and all, it would strongly behoove you to create an actual website. Technically, you could skimp out on hosting and provide free Blogspot or WordPress “websites”, but this is definitely not recommended. Mainly since it basically shows that you don’t have any income whatsoever to put into paid search, media buys or anything of the like since you can’t even afford a $20 website and domain name setup. If you can’t figure out how to do that by yourself, well… you’re probably in the wrong industry then. Sorry, bud. Next up is your company name. Most people figure, well, I don’t technically own a company of my own, so I’ll just leave this blank or indicate myself as the company. This ridiculous ravaging and pillaging of the creative/imagination realm aside, you’re certainly not going to get fast-tracked toward acceptance this way. Not no way, not no how. So just make up a company name for yourself and your online marketing endeavors and be done with it. It doesn’t have to be super-serious or super-witty, although this certainly helps. Simply having a company name to put within the network application is all that’s really needed, kind of like how you get 200 some-odd points for just signing your name correctly on the SAT’s. Instead, simply take a step back and evaluate your application. What did you fill-in? What did you say about yourself? If you’re a fraudster, then this doesn’t really apply to you despite you probably convincing yourself that it does regardless. So just go away. Once you get accepted into one network, you’ll also then be able to list said network as a reference on all your future applications. So if you’re not getting accepted by the big-dogs straightaway, feel free to try and apply for some of the mid-tier networks in the hopes of getting in. As long as you run clean traffic and don’t annoy the bejeezus out of your Affiliate Manager/Network Manager, you should be able to successfully list said network as a reference on another networks application and get a good reference no problem. Again, though, you’re going to need to be a part of the network for a bit, so don’t go trying to list a network you’ve been a part of for ten days as a reference, because it’s not going to check out no matter how much you want it to.